What Are Macronutrients & Why Are They So Important? Inside Scoop: Your macronutrients, carbohydrates proteins and fats, why are they so important for optimal health? Nutrition, health, wellness, diet, lifestyle… they all come from a want or desire to eat better, be healthy and take as many preventative measures necessary to ward off disease. But what are the fundamentals? What’s the best way to approach nutrition? If you’re trying to get ahead, improve your weight loss efforts, and have a better grasp on how it all works, there are some vital concepts you need to know. We know that it can get confusing, especially when you are bombarded daily by hundreds of articles from researchers, health gurus and even celebrities, claiming their latest solution to weight loss is the ONE that works. The essence of food can become vilified, and some very important answers to your questions get lost in translation. 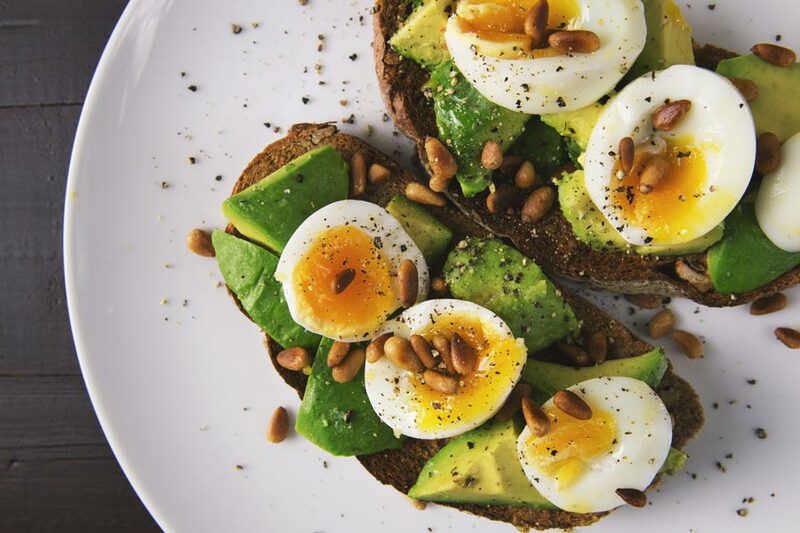 So, we are going to go back to the basics, by talking about the importance of MACRONUTRIENTS (carbohydrates, proteins, fats), and why a well-rounded diet containing all 3 is a great place to start with weight loss and nutrition. WHAT ARE THE 3 MACRONUTRIENTS? WHAT ARE THE DIFFERENT TYPES OF CARBS? Carbohydrates are most often categorized as simple vs. complex carbs. FACT: Simple carbs are made up of 1 or 2 sugar molecules, while complex carbs have many sugar molecules bound together. Complex carbs include starches as well as fibers. WHY HIGH FIBER CARBS ARE IMPORTANT. The human body can’t digest fibers, which means they remain undigested in the stool, allowing for the digestion and absorption of food to slow down. Some of these fibers also act as a prebiotics or food for our gut bacteria and keep a healthy balance of the good guys. This is important as fiber keeps blood sugar levels balanced, and reduces cravings, therefore giving you sustainable energy and a feeling of fullness. 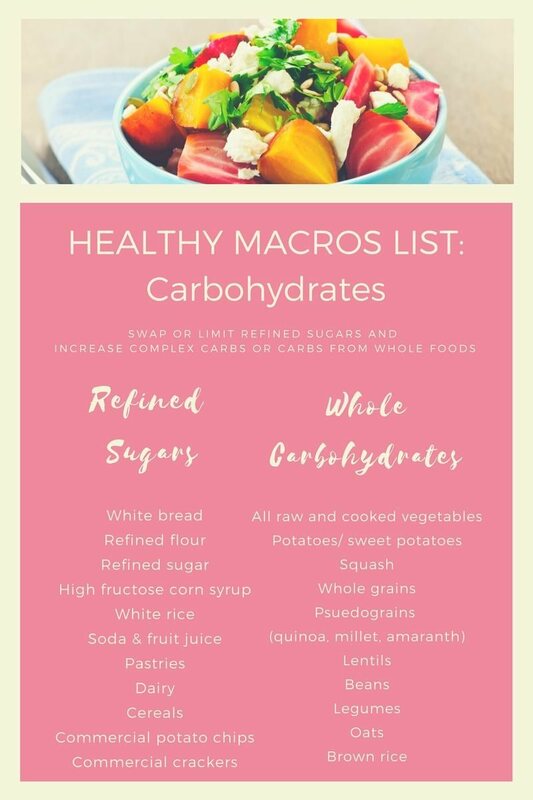 Simply put, some whole foods, like an apple, are made up of mostly simple carbs but don’t spike your blood sugars because they contain beneficial fibers. Whereas, other foods in their whole state are complex carbs (like grains), but due to processing and the removal of their fiber, end up spiking blood sugars, and in excess can contribute to weight gain (white bread, for example). Forget simple, complex, slow and fast, it’s best to remember whole food carbs that are full of nutrients, fiber, vitamins and minerals, which are necessary to produce energy in the human body. Aim to reduce your intake of highly processed and refined carbs and create a balanced diet with whole food carbs. Examples of whole unrefined carbohydrates include: vegetables, fruits, beans, lentils, nuts, seeds and whole grains and pseudograins (oats, brown rice, quinoa, buckwheat, millet, freekeh, whole wheat/spelt/kamut). Examples of refined carbs, stripped of nutrients, containing unnecessary preservatives and additive that tend to mess with our blood sugars and cause more carb cravings include: packaged cereals, white bread, white rice, white flour, chips, most pasta, cakes, candy, fruit juice and pop. Fat is also critical for the absorption of fat-soluble vitamins like A, D, E and K, as well as optimal hormone function. The simplest way of classifying fats is into saturated, unsaturated fats and trans fats. Saturated fats are typically solid at room temperature and are mostly found in animal foods such as meat, butter, cheese, yogurt, milk as well as in some plant based sources like coconut oil, cacao butter (yup, that’s in chocolate) and palm oil. Maybe you remember the “Low-Fat Diet Craze”, where you could find low fat, and fat-free everything? A time where we became terrified of all sources of dietary fats for fear of weight gain. OUR TAKE: While we do think animal-based products should be consumed in moderation, we always recommend going for the full-fat option. It’s now known that replacing fat with refined sugar has a more negative impact on your health and weight than the fat itself. No single food will make or break your health, if your diet is well balanced, and you aren’t consuming coconut oil by the bucketful. Therefore, having a diet that consists of moderate use of saturated fat is okay! 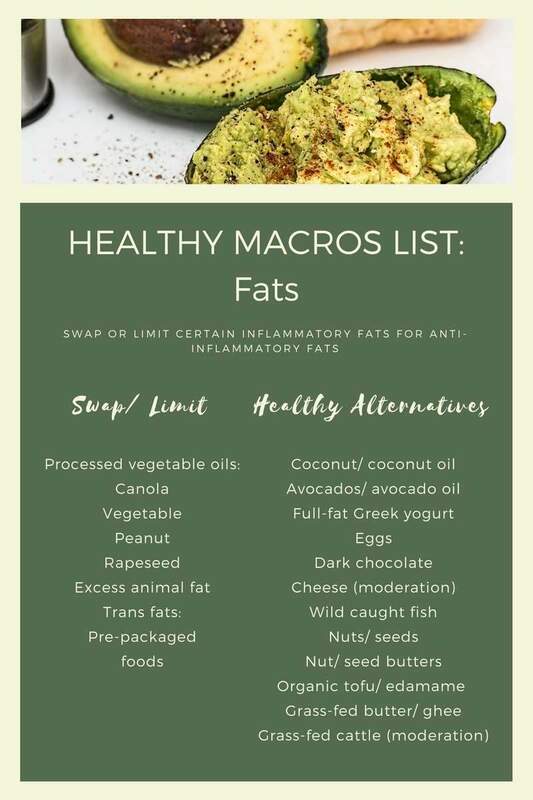 Unsaturated fats include monounsaturated fatty acids (MUFAs) and polyunsaturated fatty acids (PUFAs) and are typically liquid at room temperature. They’re found in most nuts, seeds, oily fish, olive oil and avocados. They help increase good cholesterol, are anti-inflammatory and are associated with a lower risk of heart disease. Polyunsaturated fats contain the essential omega 3 and 6 that we need to get from our diet in a balanced ratio of 1:3. Most foods contain a combination of these fats. Dietary cholesterol doesn’t seem to have as big of an impact on blood cholesterol levels as we once thought. It may only affect a small percentage of people that are genetically predisposed, but for most of us there’s no need to worry. There’s nothing wrong with having a full-fat diet if there’s a healthy balance and you aren’t over consuming one specific type of fat. Fat-free or low-fat foods often contain added sugars or artificial sweeteners, so try to reach for the full-fat option, and minimize your consumption of trans fats, as they come from hydrogenated and highly processed oils that are known to increase the risk of heart disease. Just like adding protein to your meal will help keep you full longer, adding some healthy fat will do the same. The ideal quantity guideline that we recommend for fat during a meal (oil, butter, cheese) is the size of your thumb. When you add healthy fats/oils to your diet, you may also notice an improvement in your skin texture, including a reduction or elimination of dry skin patches. Healthy fats are found in a variety of foods such as meat, eggs, nuts, seeds, and oily fish, like salmon. Purchase the highest quality you can if your budget allows. A good fat source should generally come from an organically grown, plant-based source with minimal processing to preserve its “raw” nutrient state. Look for oils that are virgin and cold pressed and have not undergone a distillation or purification process. In addition to olive oil, there are many other oils you can include in your diet: hemp seed oil, flax seed oil, and pumpkin seed oil. They each have a different taste so try some and see what you think. Not all fats/oils are stable at higher heat points. Oil for cooking at high temperatures above 400F include: clarified butter (ghee), coconut oil and avocado. Contrary to popular belief, extra virgin olive oil is one of the most stable oils for cooking for temperatures up to 400F and it’s highly resistant to oxidative damage. Avocado oil and olive oil are very similar in their fat profile and they’re our two favourite oils for cooking. Avocado oil has a higher smoke point so it is best for temperatures above 400F. Chosen Foods Chosen Blend is an example of a high-quality cooking oil that we use when bake. Fats that have a bad rep are found in fast foods, processed foods, chips, crackers, cookies and many snack foods. Most processed foods contain hydrogenated oils (also known as man-made trans fats), which are highly processed oils that we want to avoid. These oils trigger inflammation in the body and inflammation is one of the leading causes of chronic diseases. Protein is found in both animal and plant foods such as: meat, chicken, fish, eggs, nuts, seeds, dairy products, legumes, grains and some vegetables. Each person has different protein needs based on their weight, age, fitness level and other factors. Here’s a protein calculator to make it easier to understand just how much protein you should aim to consume. 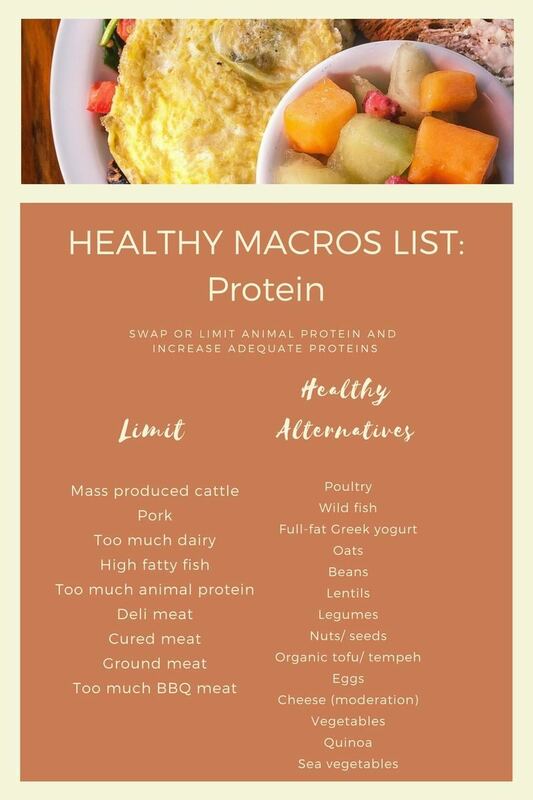 By incorporating different types of protein into your diet, you can learn which proteins work best for your individual requirements. Tracking what you eat, noting how you feel and how your body responds will give you a clear picture of what foods make you feel the best. Some people thrive off a plant-based diet, while others have a hard time. It really comes down to the individual and the diet that works for you.